Waddup everybody? 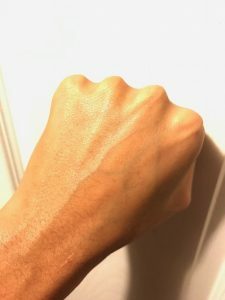 Something you might have gathered from reading this blog thus far, is that I’m always on the look out for moisturizers that won’t aggravate skin conditions like seborrheic dermatitis, psoriasis, atopic dermatitis (eczema), and malassezia (pityrosporum) folliculitis because I’ve suffered with many of these in the past. Indeed, it’s another Sebamed product! However, unlike the Sebamed Clear Face Gel this one contains 5% urea, which just so happens to be my favorite keratolytic agent! 🙂 Let’s analyze this moisturizer. 2 Application, Feel, and Scent of the Sebamed Urea 5% Cream. Perhaps you remember how long my Gold Bond Restoring Lotion review was (2,500+ words haha). Needless to say, that wasn’t the most enjoyable thing to write. Anyway, check out the short ingredient list the Sebamed Urea 5% Cream has. I’ve discussed this ingredient time and time again on this blog because I’m a big fan of it. They’re an ordinary part of the human microflora, or the bacteria and yeast that live on the surface of skin, but for poorly understood reasons this fungi becomes pathogenic for certain individuals — all the conditions mentioned above being such cases. What makes all this even worse, is that most moisturizers out on the market today (I’d wager between 90-95%) aggravate these skin conditions. This happens because the malassezia species metabolizes and grows in the presence of fatty acids with carbon chain length between 11 and 24, which translates to ALL oils. As you might have guessed, most moisturizers contain some variation of a fatty acid or oil that feeds malassezia. Caprylic/Capric Triglyceride being the exception to this rule however, because it’s an oil that only contains fatty acids with carbon chain lengths 8 and 10, which is outside of the problematic 11 to 24 range. Fun fact: I actually use MCT oil (a.k.a caprylic/capric triglycerides) to oil cleanse because it’s the only oil that doesn’t feed malassezia/ give my skin any problems. The one I use is called Viva Labs MCT Oil. The takeaway being that caprylic/capric triglycerides are great for and won’t aggravate many skin conditions caused by pathogenic fungus. The all-star ingredient in this moisturizer, and what I found most appealing about it. Urea is one of my favorite keratolytic agents. Keratolytic meaning it prevents and sloughs off dead skin, which urea does this by softening the stratum corneum (outer most layer of skin). One of my favorite stories about urea comes from r/skincareaddiction. I’m gonna share a passage from the post I’m talking about, but let me first give a little background information. Like me, the person who made the original post was struggling with rough granular texture and severely dehydrated skin. No matter what he did he always seemed to have a buildup of dead skin by the end of the day. No amount of moisturizing or exfoliation would prevent this. If you haven’t dealt with this personally, I seriously cannot explain how absolutely annoying and overwhelming it is. Your skin just always looks dull and grainy, and it feels like nothing can be done about. 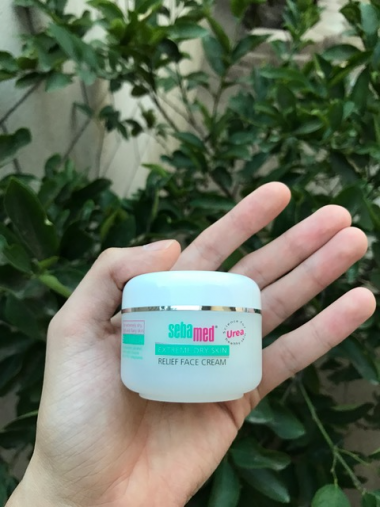 Anyway, the dude ended up buying a 5% urea cream like this sebamed one, and here’s what he had to say about incorporating it into his skincare routine. I had a very similar experience when I started using urea. In other words, the dead crusty skin build up I constantly had literally just dissolved off my face, particularly around my nose area which was always dry. What’s even more awesome about urea is that it’s moisturizing! Unlike salicylic acid (another keratolytic agent), Urea doesn’t dry out the skin. In fact, it does the opposite and provides quite a bit of hydration. That’s why you’ll often see it recommended for extremely dry skin like the soles of feet or cracked skin. You can effectively think about it like a moisturizing exfoliator. I can’t recommend it enough if your skin is easily irritated or can’t tolerate chemical exfoliation. A humectant that moisturizers the skin by binding water to its surface that it pulls from the environment and dermis. Better known as vitamin E. A natural antioxidant with photo-protective properties. It treats skin discoloration like hyperpigmentation by inhibiting tyrosinase — an enzyme that’s responsible for the production of melanin. Some studies have also shown it may help treat wounds. A.k.a. vitamin B5. It moisturizers the skin, improves barrier function, and promotes keratinocyte differentiation (i.e. keeps the surface of skin healthy by making sure everything’s working optimally on a cellular level). Some studies have shown it can treat dermatitis, and it may also help heal burn wounds. The only downside of this moisturizer because fragrance could be irritating for some people. If you suspect you have a sensitivity to it, then perhaps it’s best to steer clear of this moisturizer. And that does it for the ingredients of interest. Like I said earlier, just a very basic formula with 5% urea in it. Oh, and I almost forgot to mention this! What’s really cool about all the Sebamed products, is that they’re pH balanced (5.5) as well, meaning they keep the skin’s pH at a andhappy equilibrium which is good for its overall health and resiliency. Application, Feel, and Scent of the Sebamed Urea 5% Cream. As you can see it goes on pretty creamily, which is surprising considering how matte it looks once it dries. The consistency allows for easy spreading too, which is a plus. It’s hardly noticeable on the skin after a couple minutes, but you can definitely feel the moisture it provides. As for the scent — I want to say it smells like baby powder? But I’m not even sure that’s what baby powder smells like. It’s like a mixture of the white dove bar soap and grandma perfume. Does that make sense? Or am I the only one that thinks all grandmas smell the same? Haha…. Anyway, yes! Baby power, white dove soap, and grandma perfume — that’s what it smells like. I have to admit, it’s quite strong. My skin isn’t particularly sensitive to fragrances, but they give me headaches pretty easily. This moisturizer was no exception unfortunately. It’s the only downside about this product in my opinion. However, if you don’t mind fragrances or get headaches easily from them like I do then you’ll be in the clear with this one. 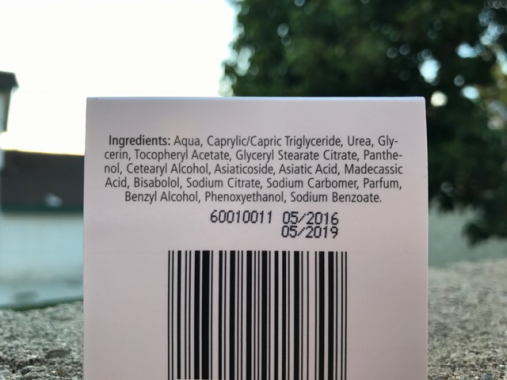 Very basic ingredient list that includes 5% Urea (moisturizers and exfoliates the skin), Caprylic/Capric Triglyceride (an oil that’s very well tolerated across many skin types), Glycerin, Tocopheryl Acetate (vitamin E), and Panthenol (vitamin B5). Deducted a star because it contains fragrance which could be irritating for some people. Provides a lot of moisture, exfoliates the skin gently, prevents build up of dead skin, and is very well tolerated across many skin types including seborrheic dermatitis, psoriasis, atopic dermatitis (eczema), and malassezia (pityrosporum) folliculitis. Spreads easily, moisturizers well, and dries matte. Would have been nicer if this came inside a bottle with a pump dispenser. Having moisturizers packed into jars isn’t the most sanitary thing in the world, and requires q-tips or little spoons to scoop the product out which isn’t ideal. Getting just a little bit pricey for the amount of product you get, but I can’t complain too much because it’s still on the cheaper side of things. A solid urea cream which is hard to come by these days. I recommend this moisturizer for anyone with very dry skin or in need of exfoliation, or whose skin is easily irritated by chemical exfoliants like salicylic or glycolic acid. Urea will do a very similar job, however it doesn’t irritate the skin and provides a lot of hydration. This product is also compatible with malassezia-induced skin conditions like seborrheic dermatitis, eczema, pityrosporum folliculitis, rosacea, and psoriasis. Tell your friends about why they should be using urea! Share this! Even every message ive sent seems not delivered yet im still commenting here. Thanks to you because im slowly completing my products. I use hada labo light and cosrx snail mucin its working the redness reduced really but when i washed my face its still there. Im new here please bear with me. Anyway about urea, if i will use the hada labo plumping gel with urea, is it advisable if i can use it until i finished the bottle? Or 3months is the maximum usage? Please anyone who read my comment please help me to analyze every detail. I have combination and very sensitive skin type. I have seborrheic dermatitis on my chin and i think its forming also on my cheeks and between my eyebrows. I have read somewhere to the comments that said the KETOKONAZOLE SHAMPOO cured his facial seborrheic dermatitis. I am interested on how he do that. Please help? I use both AHA and BP at night after washing my face. Where would this urea cream fit into my routine? OMG! I am 32 and dealing with a blemished face ever since i can remember. I have done everything.Finally I came upon yoour article on “yeast” acne and it all started to fit. I realized that i have suffered from eczema before and I suffer from dry dandruff. Finally, i found the reason. This whole time doctors and I have been working on my skin as with traditional acne. After i changed my skincare routine I noticed a huge difference, but on the other hand my skin in general began to show signs of dehydration, dullness and worst of all aging like never before. 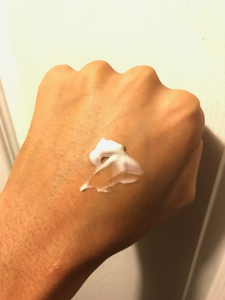 That sucked, cause I’ve been looking young this whole time (no one gives me my age;) ) I tried the Hado Labo Skin Plumping Gel and was underwhelmed. It didn’t do anything for me at all. So I started to get depressed again. I tried the hado labo, layered with squalane (cheap in my country and even use it as make-up remover),finished last layer every night with vaseline. But still my skin would be dull by the end of the day, a ton of dry flakes where i would get a blemish/breakout, and my skin had like this really wierd lack of elasticity. The Hado Labo ended and I came back to your site for recommendations. 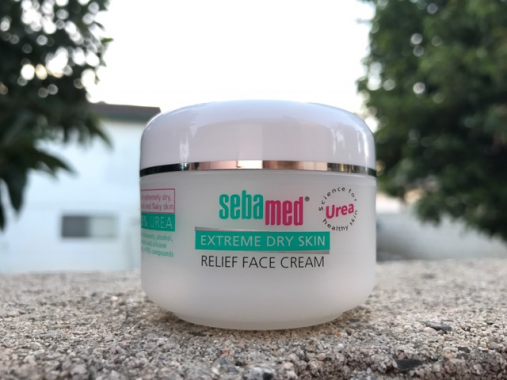 I decided on this Sebamed Urea cream and found that they sell it in Germany. Damn! It’s been 1,5 weeks. I am like 10 years younger. My skin looks fresh all day. My color has warmed back up. No dry flakes. No dryness by the afternoon. No new breakouts. No discoloration. Elasticity has come back so I have less wrinkles. My skin is baby soft, so so so so soooooft. I love this stuff soo soooo much. I just want to put this on all day. My healing blemishes I just cover with vaseline so they heal, but the rest of my skin is so nice. This is amazing! You don’t know how much i praise you and this cream with every patting in the skin! P.S. The scent is strong as you say, but i presume that the true sent of these ingredients probably aren’t any better, hence the strong parfume. Would you recommend creams with Caprylic/Capric Triglyceride for someone with acne prone skin? I used in sunscreen with that ingredient in it once and broke out so badly. I was pretty sure it was because of that ingredient but I could be wrong. Please advise <3!